What’s the first thing you think of when you hear the word “fan”? Today I have the pleasure of interviewing Denise Tanaka, the talented writer of a delightful fantasy novel, Truth in Cinders. Denise is a lifelong writer of magical beings and fantastic worlds. Her short stories have appeared in issues of SQ Mag (edition #17), of New Realm (Vol. 1 No. 12 and Vol. 2 No. 6), in the annual anthology Once Upon A World No. 7, and her latest story appears in the AlternaTEAS anthology edited by Elizabeth Gilligan. In her spare time, she creates historical and fantasy-based costumes. Her live spin transformation Diana Prince-to-Wonder Woman costume won Honorable Mention (Journeyman) in the masquerade at Sasquan the 73rd World Science Fiction Convention. Welcome, Denise, and thank you for talking with us today. Let’s jump right in. Is there a difference in your short stories and your novels, other than length? Yes, my short stories tend to be contemporary urban fantasy and my novels are epic other-world fantasy. One reason is that short stories don’t give a lot of space for elaborate, original world-building. I need to dig right in to a short story whereas a novel has more room to explore. Short stories focus on a moment, or a single revelation, and a novel is a longer journey with a sequence of many moments leading up to a conclusion. What’s one of the first books you remember reading or having read to you? One of my earliest memories is sitting on my mother’s lap while she read The Gingerbread Man. I still have the book, though it’s a bit tattered by the years. It has colorful illustrations. I recall feeling a bit sad in the end when the gingerbread cookie meets his untimely demise. What attracts you to the fantasy genre? Fantasy has the most possibilities. It can have the most unique, imaginative creatures or events. It is not constrained by the laws of physics. The hero and heroine don’t have to wind up happily-ever-after together. Literally anything can happen! Frankly, I am often bored by mainstream fiction or romance-for-the-sake-of-romance type books. If I weren’t writing fantasy I would probably write detective mysteries. I love unlocking secrets and discovering surprises in the end. What do you feel like when you are writing? I feel removed from the real world yet still a part of it. I am in a semi meditative state, almost hypnotized, yet lucid and aware of structure and grammar. I swim in and out of my own imagination. Can you tell us about your new release? What inspired you to write it? I’m a fan of old t.v. shows like, “The Immortal,” “The Invaders,” “The Fugitive,” and “The Incredible Hulk.” I wanted to tell a story from the point of view of somebody who lends assistance to the lone man on the run. In the t.v. shows, the people who shelter the hero seem to accept his innocence pretty quickly. But if you’ve just met this guy, how can you be sure he’s telling the truth? That he didn’t do it? I overlaid some fantasy elements, tied it into my original universe, and I was off! If I could add one more thing? I wrote the first draft of this novel many years ago when I was part of a writer’s group with Elizabeth Gilligan, Teresa Edgerton, Kevin Andrew Murphy, and others. I got some great feedback but, at the time, my writing skills were not yet developed to the point where I could implement their advice. Then, I reconnected with Beth Gilligan at a local convention and she asked about this story. After all these years, she still remembered some elements of the plot. It inspired me to dig it up out of the drawer and do a fairly extensive rewrite of the magic system and the events of the second half. I’m glad that I put it aside while I built up my skills on other manuscript drafts. I’m pretty happy with how this final version turned out. Which of your characters do you feel closest to or enjoy writing most? Which scene was particularly hard to write, and why? The opening! That first page needs to grab the reader’s attention while relaying information about an unfamiliar world. Originally, I had a couple of pages watching Condrie the tavern maid go about her morning chores and thinking about her life. I put it up for critique in an online forum and they convinced me to shave it down. How do your hobbies or real-world passions and projects show up in your writing? For most of my life, I’ve pursued a hobby in historical or fantasy costuming. I am a member of the Greater Bay Area Costumers Guild http://www.gbacg.org/ When I describe my characters’ wardrobe, I am very conscious of the materials and fashion. Do you write full time, or do you have another role? If so, what? My day job pays the bills. I work as a paralegal in an immigration lawyer’s office. I’ve in this field for about 12 years. If you could go anywhere in the world, all expenses paid, where would you go, who would you take with you, if anyone, and why? Easy! Viña del Mar in Chile. A few years ago, I researched a non-fiction true crime story that happened 100 years ago. One of the key personages came from Chile and I became fascinated with the colorful history of the area. I would love to explore the amazing sights of Easter Island, Patagonia, and the Andes mountains. Whoever wants to come along is welcome. Condrie the tavern maid befriends a man on the run only to discover he is a firebird disguised in human form. Together they must elude the tyrant king’s relentless forces while seeking the truth of who massacred other firebirds enslaved to the king. Are you in the mood for a sweet treat, a romantic novella that won’t cost you a penny? How about five sweet treats in one package? Check out The First Sentence! Download for free now. 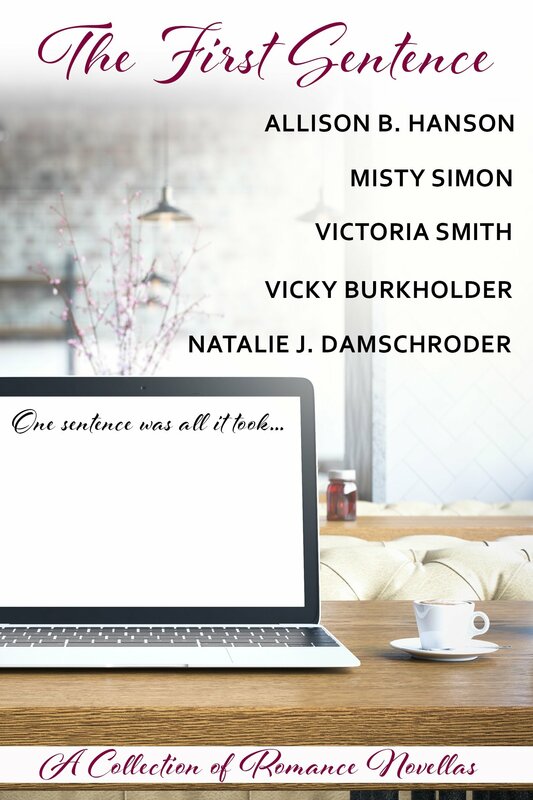 Put five authors together in a bar and give them a challenge. The premise: That if five authors start with the same sentence, they will all write vastly different stories. The results: made of awesome. From contemporary to futuristic, these novellas have a little bit of everything, but most especially—love-filled happy endings. First and foremost, if possible, you want the main protagonist to be female. And unless the reader happens to love science, you don’t want hard science fiction, you want soft: anthropology, sociology, psychology, ecology, and so on. If the woman reader has interests in certain areas, you might want to build on those interests. I’d recommend one of those three, with Tepper being my main choice. If you want a few more suggestions, I’ll break the female-main-protagonist rule. Elizabeth Moon’s The Speed of Dark. Ursula K. Le Guin’s The Left Hand of Darkness. Joan Slonczewski’s A Door into Ocean. Lois McMaster Bujold. The Warrior’s Apprentice.